The most common mistake with picky eaters that I see parents make is that they stop serving their kids foods that they don’t eat. I understand why parents make this choice. It seems futile to go to the effort of making food only for your child to ignore it. Or, loudly announce that they hate it. Or, melt down from just seeing it on their plate. It seems like a waste of your precious time, a waste of food, a waste of money, never mind the heartbreaking feeling that your child is rejecting you. However, stopping serving the dreaded vegetables/ meat /[insert the foods your child doesn’t eat] is the wrong way to go. Deciding that you’ll serve your child vegetables [insert the foods your child doesn’t eat] once they like them is like deciding that you’ll take your child to the pool once they know how to swim. Of course, you need to take your child to the pool so that they can learn how to swim. They aren’t going to suddenly wake up one morning knowing how to swim. The same goes for foods your child doesn’t like. They won’t learn to like them if they never see them. Research shows that kids need to try foods somewhere between 10 – 30 times before they learn to like them. That doesn’t count the number of times that a child needs to see a food before they’re willing to try it. Of course each child and each food is going to vary in the magical number of times. I just learned to like Brussels sprouts last year and trust me, I’ve tried them way more than 30 times. A study showed that parents usually give up after trying 5 times. So you haven’t even made it to the minimum number of presentations never mind the top end of the average range. So what’s the solution? Plan meals that include both safe foods and challenging foods. One meal for the whole family that includes at least one safe food for your child. 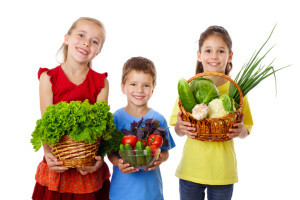 Yes, if you have more than one child you will need to include safe foods for each of them. What should the challenging foods be? Foods that you eat in your family. This way you aren’t making separate foods just for your child, which, when they aren’t eaten, feels like that waste of time. You’re cooking food that you’ll eat. If the kids don’t eat it – then more leftovers for you! No wasted time, food, or money. The powerful word in this situation is “yet”. Your kids don’t like it yet. Serving a food again and again is how they learn to like it. Just like how a child who is starting swimming lessons doesn’t know how to swim yet. Keep up with the practice and trust that your child will get there. Get successful strategies for picky eaters. Sign-up for my e-newsletter.